Another tough day out today looking for pan fish. That south west wind today was insane. I was soaked both coming and going cutting across Grass Lake. Got about 7-8 crappies for the day. Even in the channels I just could'nt get out of it. I hate the wind!!!!!! Catherine has or will have some gills staging for the spawn in the area I marked on the map. 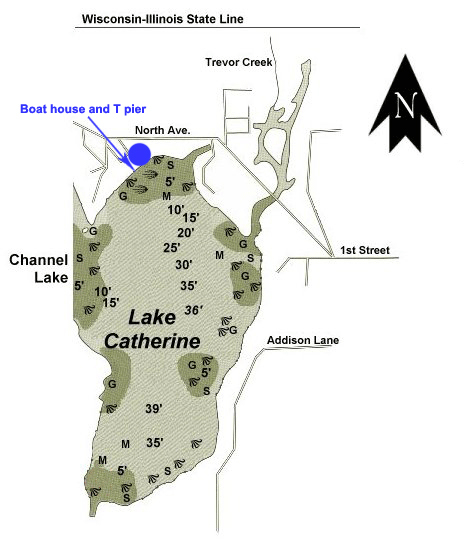 There is a boat house with a T dock right in front of a boat house with a ton of gravel that pulls gills and crappie to the area. The guy that owns the boat house ropes the area off and will sit and yell at you, he thinks he owns the gill's and the water that you are sitting on, pay no attention to the man behind the curtain. Bring a long lightweight stick if you have one and it will be panfish galore. I fish a 9' light and it gets me everywhere I need to go. Marc, Thanks for the tip on location of that gravel bar. I'm pretty new to fishing the chain, only my second year of open water out here, so I'm always looking for new spots to add to my game plan. I may head back out this afternoon and give it go. I've been fishing Lake Geneva almost exclusivly fo the last 15 years, so I'm just trying to learn a few new bodys of water for a change of pace. Tight Lines! Chitown-Angler was started on February 10, 2003 and has received 207857754 page views in total since that date.